Based on the poems of TS Eliot, the “book” is really a series of sung-through vignettes and character studies about various felines who, it seems, are just like us. 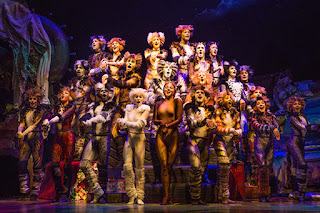 The songs are unmistakably Andrew Lloyd Webber: “Jellicle Songs for Jellicle Cats” has a bouncy melody that swiftly propels us into the junkyard-gathering place of our various protagonists. “The Magical Mister Mistoffelees,” has distinct echoes of “Joseph’s Dreamcoat. . .” right down to a multi-colored LED jacket. But the one song everyone is here for is “Memory.” Sung by the “faded glamour cat,” Grizabella, here poignantly embodied by Keri Rene Fuller, it does not disappoint and Fuller’s passionate delivery inspired many people to leap to their feet. The costumes have been tweaked a bit, and newer stagecraft technology has been employed to make things a little sleeker and shinier, but the biggest production change was to hire “Hamilton” choreographer Andy Blankenbuehler to update the original choreography. His influence seems to be in the speed of the movements and the more modern athletic aesthetic touches. It is here, in the dancing, that Cats really stands out. One would be hard-pressed to find a show with more company-heavy numbers, each one requiring, at almost all times, intense precision and the undisputed talent of the 22 performers. Some might just come for the songs, but you'll leave remembering the dances, too. Caitlin Bond, as the white kitten Victoria, may not have her own song or story, but her character is a strong presence throughout. With her impressive ballet background, Bond is a featured in many of the numbers, embodying the more physics-defying attributes of a young cat. Tony d’Alelio and Rose Iannaccone’s duet dance number “”Mungojerrie and Rumplelteazer” was a pure physical delight. McGee Maddox’s “The Rum Tum Tugger”, was an audience pleasing glam-rock number and “The Old Gumbie Cat”, led by Emily Jeanne Phillips, proved that cats and mice AND cockroaches can tap dance. 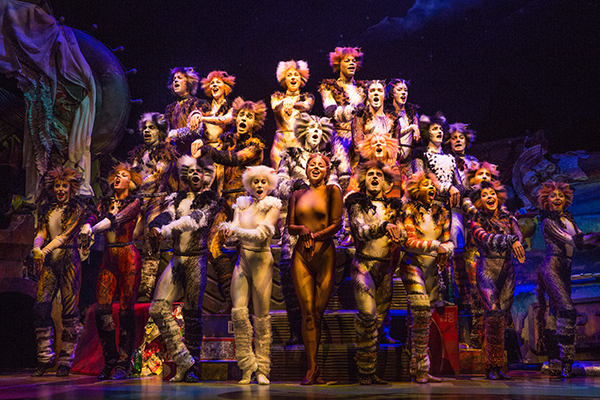 Billed as “not your grandparents' Cats,” this tour boasts the involvement of almost all the original Broadway production staff, but gives it just enough new polish to make the show worth revisiting, or simply seeing again. Once again Barrington Stage presents ten 10-minute plays for Pittsfield’s Upstreet Arts Festival. Last year’s 10x10 was a wonderful exposure to ten new mini-plays. Each performance filled the house. Please refer to the BSC website on February 25 for information on the format and actors. The formula remains the same. It is the actors who change roles in each piece. Directors for this winter’s crop of “playettes” are Julianne Boyd, Barrington Stage’s Artistic Director and Matthew Penn, an Emmy-nominated director whose talent is seen often in the Berkshires. Most of the plays are comedies or dramedies, yet a few are quite serious. 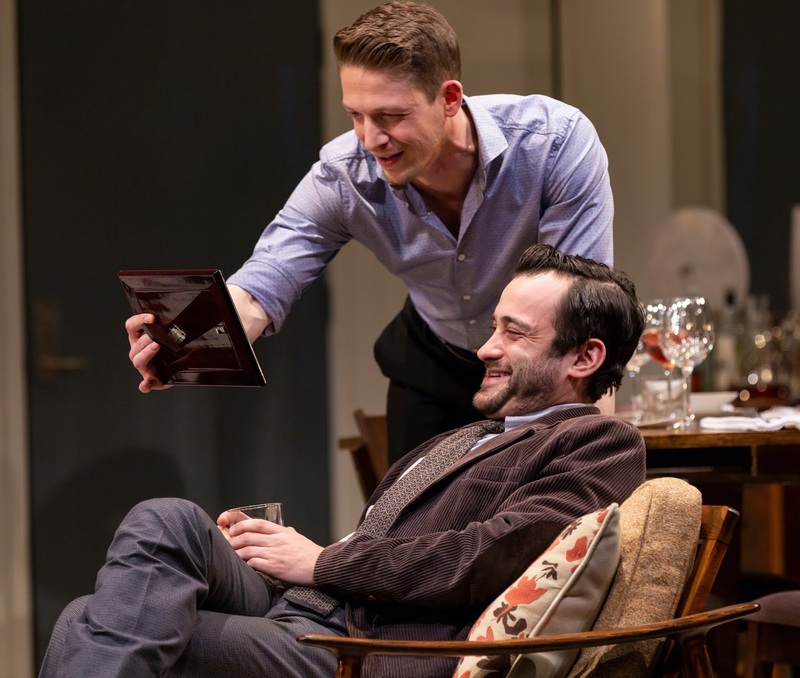 Oftentimes, it doesn’t take more than ten minutes to shape a meaningful piece of theatre. The showcase offers the opportunity to see the work of ten playwrights, one after another, on the same stage. After a string of sold-out shows in “Murder For Two's” opening week, Playhouse on Park has added two additional performances to its calendar. The added shows are Saturday matinees at 2pm, on January 26 and February 2, respectively. 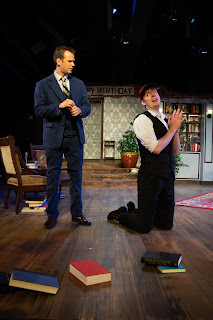 “Murder for Two” is an uproariously funny musical murder mystery with a twist: one actor investigates the crime, the other plays all of the suspects - and they both do this while playing the piano. A zany blend of classic musical comedy and madcap mystery, “Murder For Two” is a highly theatrical duet loaded with killer laughs. This fast-paced whodunnit stars John Grieco as The Detective and Trevor Dorner as The Suspects. Kyle Metzger directs. The fourth “Masterworks” program of the HSO’s 75th season showcased their own concertmaster Leonid Sigal and associate concertmaster Lisa Rautenberg as guest conductors in a varied selection of music by or related to Johann Sebastian Bach. The concert opened with two short pieces by French contemporaries of Bach: the overture to Rameau’s opera-ballet “The Temple of Glory;” and a chaconne from Lully’s opera “Phaeton.” Yale early music specialist Grant Herreid played theorbo (14-string bass lute) in both works, and baroque dancer Carlos Fittante added graceful movements to the chaconne, a stately dance for the court of Louis XIV. Rautenberg led a reduced HSO in animated performances. Rautenberg then picked up her violin to play the solo part, and lead the ensemble from the bow, in a supple account of Bach’s first violin concerto. In his familiar third orchestral suite, Rautenberg drew fleet renditions of all five movements from her musicians, with an especially flowing “Air” on the G string. The concert’s first half closed with two rarities: the “Gran Chacona,” a secular song by Bach’s Spanish predecessor Juan Aranes; and a sonata-variations on the traditional theme, “La Follia,” by his Italian contemporary Vivaldi. Herreid returned to introduce, sing, and play baroque guitar in the Chacona, which he had researched and reconstructed (relishing the robust “a la vida bona” [to the good life] chorus). Both pieces featured loving accompaniment by Rautenberg and the orchestra and stylish poise, with elegant period costumes, from Fittante and fellow dancer Robin Gilbert Campos. Intermission was followed by two relative novelties from twentieth-century composers. Villa-Lobos’s “Bachianas Brasileiras No. 9” for string orchestra combines rhythms of the composer’s native Brazil with Bach’s beloved “prelude and fugue” structure. The Bach-era title of Jacques Ibert’s “Divertissement” suggests the light entertainment value of this colorfully orchestrated piece, which includes hilarious parodies of Mendelssohn’s “Wedding March” and Strauss’s “Blue Danube” waltz. 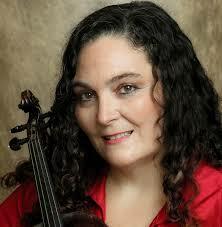 Sigal’s kinetic leadership elicited both the profundity of Villa-Lobos and the pzazz of Ibert. The following is an interview with Alan Schneider, one of the co-founders of the Panopera (PO), and one of troupe’s three managers. 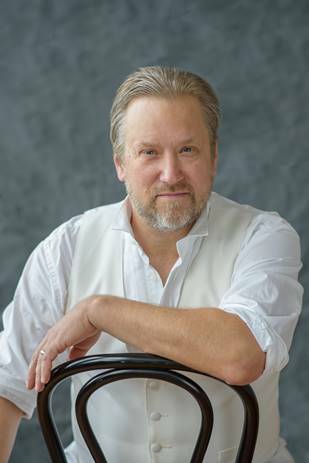 Schneider has worn many hats, both literally and figuratively: sung leading roles, sung in the ensemble, directed, and made sure the shows broke even. Panopera, a relatively new artist-led opera company based in Western MA, will perform “Sweeney Todd”’ for two performances only. ITS: How and why did PO start? What is the mission? PO: The purpose of Panopera since its beginning in 2014 was and is to make use of local artists and local resources to create performances for public consumption. Think of us as a CSA (Community Supported Agriculture), but for the arts- a Community Supported Arts organization. The company presents some of the best local talent and resources in full length, high quality opera. ITS: How are operas chosen? PO: We choose repertoire based on a few criteria: scale of the musical forces, since we have yet to present a work with a reduced orchestration (although our string sections tend to be on the small side), whether or not we can cast it with primarily local artists, and, for these first few years, whether or not the orchestra parts are in our library. ITS: What would you say to potential audience members who “fear” opera? PO: I would say that opera is theater, plain and simple, and, language barrier aside, if you like musical storytelling of whatever genre, opera will probably appeal to you. ITS: I’ve noticed in PO photos that the cast members seem to be dressed in contemporary style. Do you think this makes the work more accessible? PO: We give no thought at all to making a work “accessible” beyond what one does normally to make any production clear and consistent. We believe that the idea that the public needs special help to understand or appreciate a work of art is unnecessary. ITS: “Sweeney Todd” -- a wonderful musical, is not an opera. Why was “Sweeney” selected? PO: Interestingly, the very first American company to produce “Sweeney Todd” after the original Broadway production and touring was the Houston Grand Opera, in 1984. Here’s an interesting anecdote. (courtesy of Wikipedia) It is said that on opening night Harold Clurman, the doyen of American theatre critics, rushed up to Schuyler Chapin, former general manager of the Metropolitan Opera, demanding to know why he had not put it [Sweeney] on at the Met. To which Chapin replied: "I would have put it on like a shot if I'd had the opportunity. There would have been screams and yells but I wouldn't have given a damn. Because it is an opera. A modern American opera." Also, we’re in a position to present the piece with its original orchestration, which is a rare thing nowadays, 2019 is the 40th anniversary, and we have yet to present a piece in English. ITS: What are you most proud of about PO? PO: I am most proud of the group of artists who have assembled to do each of our projects. I am grateful that so many of my professional colleagues are willing to invest their time and effort to expand the theater and music market in the Valley, which will ultimately benefit all of us. ITS: What are plans for PO? PO: To continue to find collaborators, as we have with Pioneer Valley Ballet, to present an ever-wider selection of opera to the public. “Sweeney Todd, the Demon Barber of Fleet Street” will be performed on January 25th at 7:30pm and January 27th at 2pm at the Academy of Music, Northampton. For ticket information contact the Academy box office: 413-584-9032 or www.aomtheatre.com. The Majestic Theater's current production of Katori Hall’s “The Mountaintop,” directed by Gilbert McCauley, is an intriguing combination of fact, faith, and fantasy, based on the last hours of Dr. Martin Luther King’s life, set in room 306 of the Lorraine Motel. That humanity is reflected in the everyday trials of a man who must travel, who finds no toothbrush in his suitcase, has holes in his socks from marching, and orders a late-night cup of coffee. That simple action brings the spirited and disarming Camae to his door, and there begins the unexpected journey that shakes the core of Dr. King’s thoughts and values. What starts as a casual interaction of social pleasantries between the two, begins to morph and grow into a series of stranger and more probing exchanges. Each of these interactions forces Dr. King to examine, question, and defend his actions, his motives, and his very faith. Who is this late-night visitor who troubles him so? Is she actually a housekeeper, an undercover spy, or even a temptress? 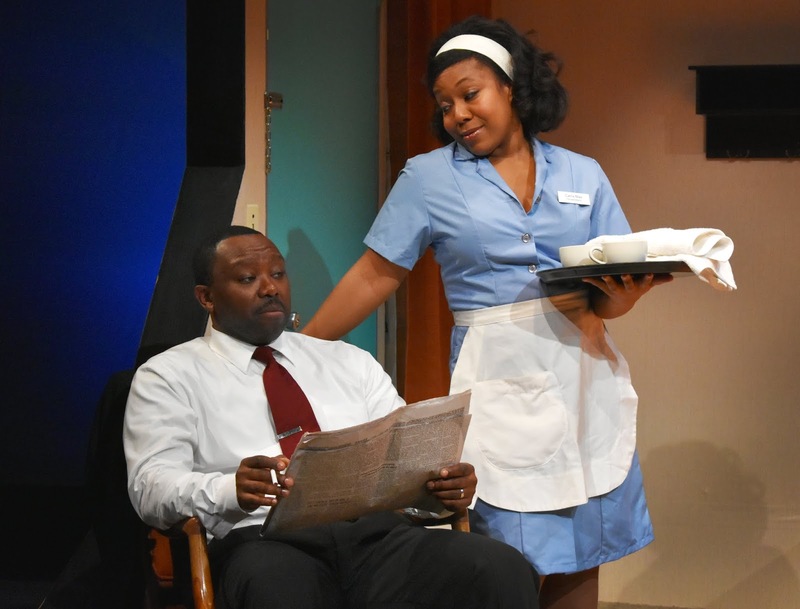 Mangan plays the role of Dr. King with a down to earth authenticity, ranging from humor and optimism to languishing uncertainty over his legacy, while Freeman fills the stage with a thought-provoking mixture of street smarts and incisive questioning. 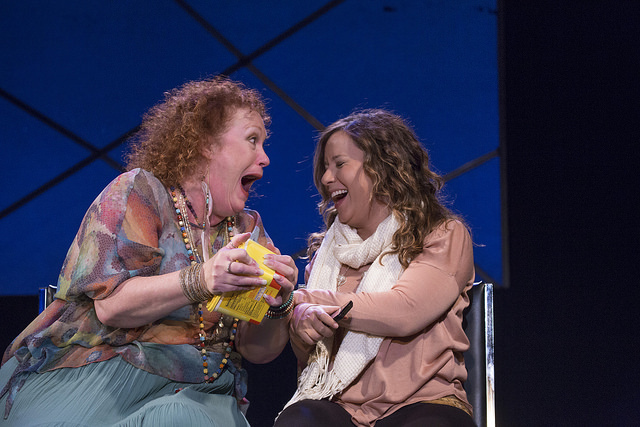 Hall’s script takes her audience through all of these challenges with a gritty humanity and surprising humor that gives a fleeting and inspiring look into the dichotomy of greatness and self-doubt, and which brings an audience to its feet.